My Christmas wishlist was mostly RV related and I got plenty of accessories I wanted. I will be posting details as I install them and when I do that will depend on the weather. One gift needs no installation though. I got a Sewiepig! This little pink porker weighs almost nothing and just rides along in the trailer’s storage compartment until he is needed. Then, fill him with water and he becomes a hefty hog who can hold down the sewer hose. No more looking around for bricks or rocks or trying to keep one foot on the top of the hose while stretching out to open the drain valve. 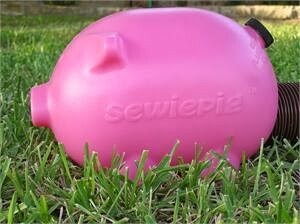 Sewiepig pig does the job. My only worry is getting this little piggy to stay home. I know that the vast majority of RVers are honest but, this little guy just might be too tempting a target for one of the rare would-be pig nappers out there. More likely, some child might innocently think he is a toy and walk off with him. I really hope he doesn’t disappear in the night! I will have to be careful to keep him locked up when he is not in use.